From Mother in Law with Love - Leo Tunapika? Some Saturdays ago we had dinner over at my other family. We usually have a great time and never leave till it’s like pretty late. As is my mother in law’s tradition, she gave us some goodies to carry with us once we were about to head for home. This time round she gave us some unripe bananas. I saw it as a challenge since I don’t think I’d have ever thought of cooking matoke. As I was thinking of how I’d prepare them then ‘eureka’ I remembered that my mother had prepared matoke occasionally and I think I could remember just how she used to do it. First things first, peeling the bananas and potatoes. I recall that unripe bananas has some stuff which I only know their name in my mother tongue:-) that sticks on ones hands. I used to see my mum apply some cooking oil on her hands so as not to get the ‘whatchamacallit’ on her hands I faithfully did like her and peeled the bananas without a hitch “yippee”. 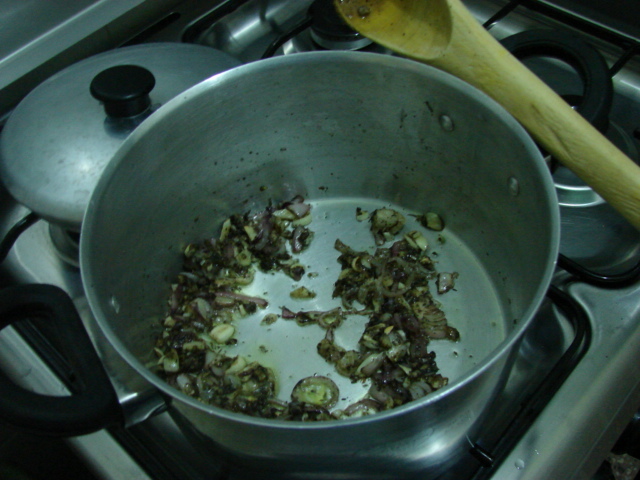 Once everything is peeled and washed set aside and start on frying the onions. The colours look yummy, don’t they? I didn’t put tomatoes in this recipe since I wasn’t quite sure if they were necessary, are they? Then add the bananas and potatoes and stir till everything is combined and cover for about 5 minutes to let the spices soak in. 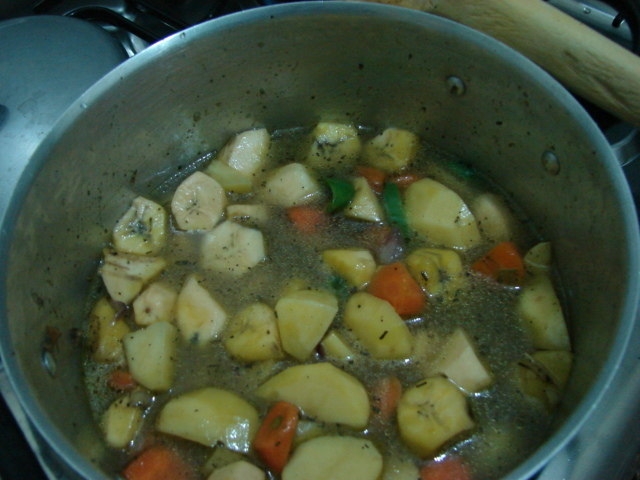 Then finally add in your water or stock (beef, chicken or vegetable), I used water. As for the amount, I normally measure with my eyes and I remembered that my mother used to put the water almost till the level of the bananas. 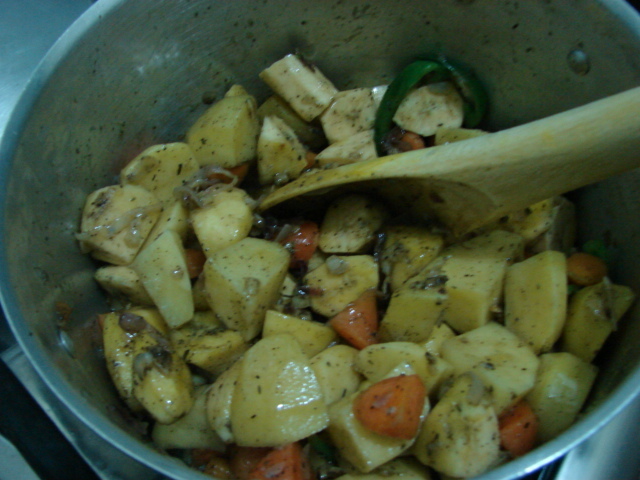 Cover and let them cook over medium to low heat for about 40 minutes or until the potatoes are done. You’ll wait to see the end result on my next post. Does anyone else experience the sticky stuff when peeling unripe bananas? Oh yes! The sticky stuff makes you dread peeling unripe bananas. It’s called matinovo in kiembu. I also don’t know the english word. You can add tomatoes. Waiting to see the final result :-). we also call it matinovo. 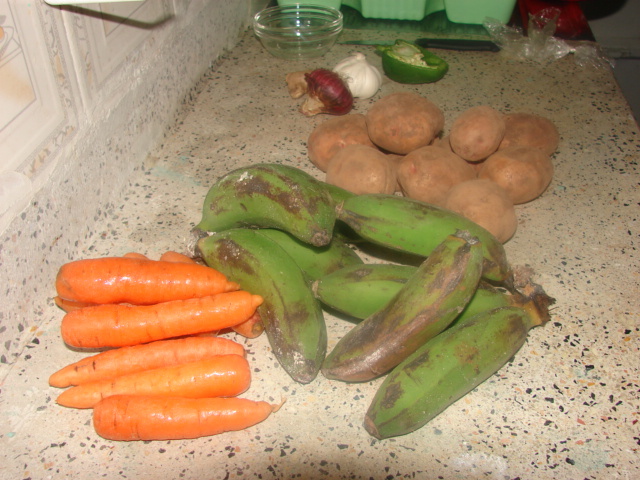 in case I cook matoke again I’ll try with the tomatoes. 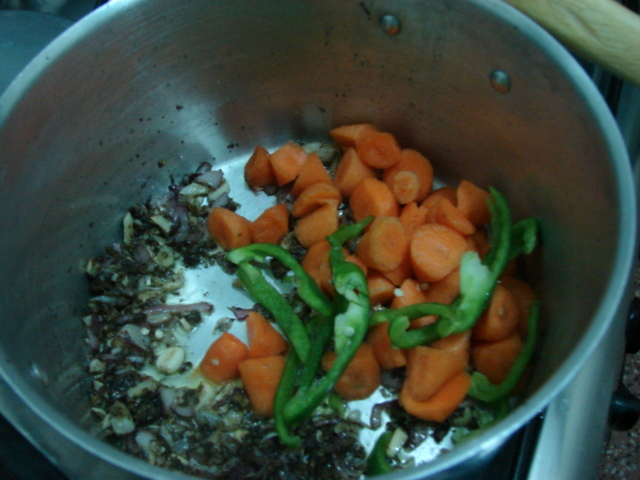 Pingback: Beef Stir Fry with Matoke « Leo Tunapika? I also apply oil on my hands before peeling the bananas. Next time I’ll try putting the coconut milk. In Meru we call it matinovo. I’ll try putting them in salty water. Newly wed u cant imagine how much of a struggle it is to think of what to cook. Someone help with a menu? Welcome to the blog, glad you like the blog already. I know it can be a challenge to think of what to cook, worry not we are here to sort you out. Do want a weekly menu?